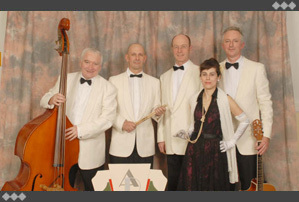 Art Deco Quartet has an established reputation for performing classic popular tunes from the 30s and 40s. Tunes with lasting appeal such as the sophisticated 'Cheek to Cheek', the shady 'Mack the Knife', the powerfully romantic 'My Funny Valentine', the infectious 'Brazil' and the mysterious 'Caravan'. The style is elegant, the music melodic and the attitude is professional. The quartet is augmented by the seductive vocal talents of Betty Davila when the occasion demands.